I didn’t do my son’s first birthday justice, so I wanted to do something a bit more special this time around. I got lots of inspiration from this site and decided to attempt a tiered fondant cake. I checked out a few other sites for tips and techniques and decided to give it a shot, so this is my Sesame Street Birthday Cake. The top tier is a two layered 6” cake and the bottom layer is a three-layered 10 inch cake. I ended up using one cake mix for the top tier (both layers came from one mix) and 3 mixes for the bottom tier. I was trying to build it up high enough to fit 3” letters around the bottom tier, but I never got it quite high enough. I would recommend the strips that Wilton sells for even cake baking for a pan that large or larger. I had to cut off a lot of cake to get the layers even since it rose so much in the middle. I feel as though I would have gotten the height I wanted in two layers if the cakes had baked more evenly. 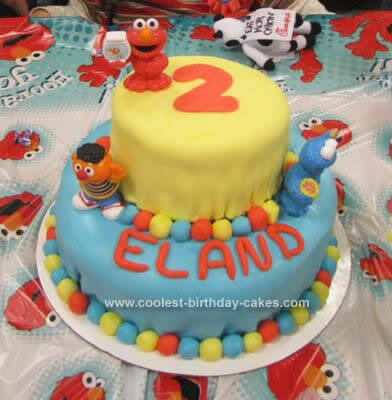 I used the White Chocolate Fondant recipe from “Coolest Elmo Cake 79.” That was a messy process and A LOT of work! I used Wilton colors to tint the fondant. The one recipe yielded enough to cover both tiers, the fondant balls, the number 2 on top, and the rolled letters in his name. I planned to use cookie cutters to cut his name out in fondant (like the 2 on the top) and I think I would have barely made it. I was out of time, energy and fondant to do the characters, so I just bought them from Target/Walmart. They come in packs of two for $6. The characters are designed to integrate with a Sesame Street playhouse and have a hole in the bottom. It was the perfect size to accommodate a wooden dowel. That made them easy to position without the chance of them falling off or sinking into the cake. I couldn’t get the fondant smooth on the bottom edges so there were a lot of puckers. That was the only part that wasn’t quite right. Otherwise, I was very pleased with how it turned out. I got lots of compliments at his party and from friends and relatives who saw pictures later. The birthday boy loved it and that is all that matters! I spent at least 10 hours on this cake.